Breaking trail is hard work! 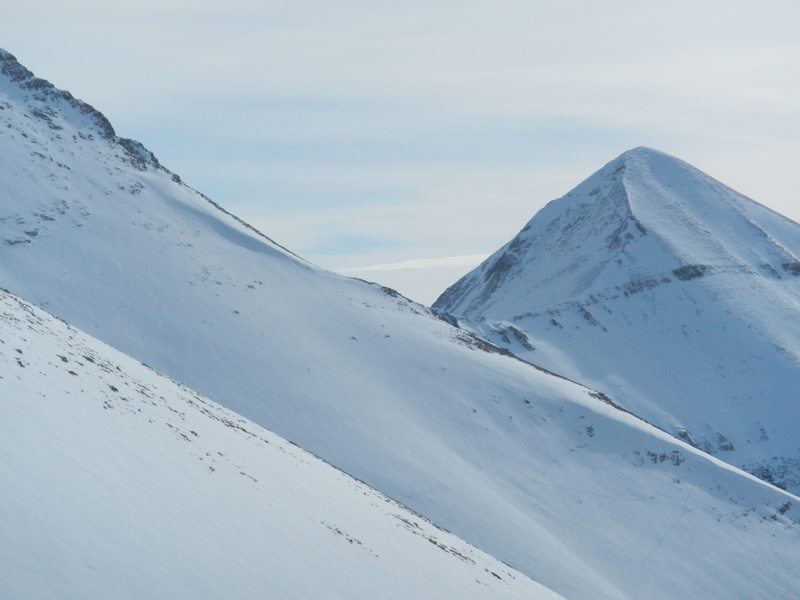 It was an ambitious attempt – walking the Yavorov hut up tot he ridge, traversing it, reaching Mt Vihren and descending back to Bansko on foot. All in, we estimated this would be about 23 kilometres. We started before dawn and drove as far as we could up a snow- and ice- covered track towards Yavorov hut to the north of the west of the ridge. The sun rose as we drove up the single track, cursing as the daylight revealed cliffs to one side as the car slithered uneasily over ice towards the abyss. We were relieved to ditch the car out of the way a few hundred metres short of the hut just before the track turned into a skating rink. Kitted up, we found the trail and made our way past the impressive Yavorov Hut (1740m) and upwards through the forest. Though it has been a mild winter, there was snow underfoot in the shadow of the evergreens and I felt the morning chill. A week of skiing and mountaineering had taken its toll on my legs and they started off like lead blocks and took some coaxing to ease back into another day of activity. Following the marked path heading in a south westerly direction, the next building we came across was the Bunkera refuge, a former partisan hide-out. 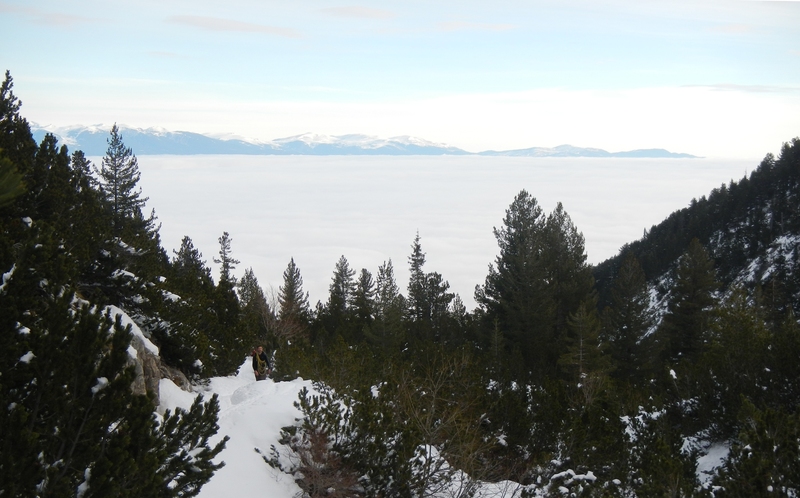 Shortly after that the forest thinned out, revealing a beautiful view back down toward the valley below, covered in a duvet of cloud. Facing forward again we could see the line of the ridge above and in front of us, but it took a while to reach as the snow deepened once the forest thinned out. From the spot on the ridge where the trail took us (Razlozhki Suhodol, 2571m) we followed the trail along the ridge, dropping down below the actual ridgeline and breaking trail through knee-deep snow. Progress was slow – we were the only people visible anywhere on the mountain range. There were a few tracks through the snow and most of them either were not human or were not going in the right direction. The trail had small painted markers on rocks every few hundred metres, but in the snow they were not always apparent. The path had us contouring round mountains; we tried not to veer too high or low off course, lest we get stuck on steep technical terrain and have to backtrack. It was now early afternoon. We had been pushing hard but the initial journey to Yavorov hut had been slower than we had anticipated. Breaking trail on steeper ground was slower than we had anticipated. Route finding was time-consuming. 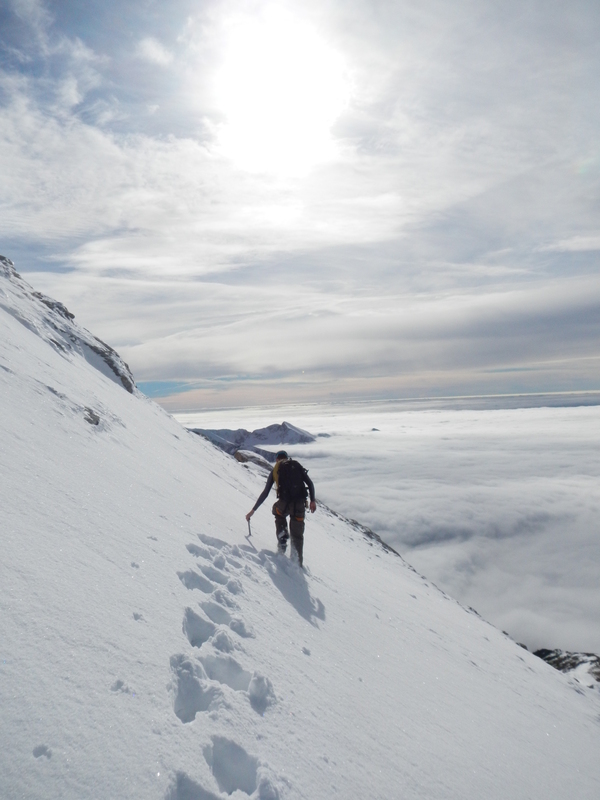 Changing snow and rock conditions forced us to take crampons off and put them on again within a few hundred metres. All in all, we were against the clock – the sun had warmed us up and was now starting to dip in the sky. Having been warned by numerous locals about the dangers of Koncheto in summer, we did not want to tackle it in the dark in winter. Besides, we still had approximately 12 kilometres to go after the ridge, descending technical and unfamiliar terrain… And that would only get us to the main area of the ski resort, which would be closed, leaving us with several more kilometres to walk back down into Bansko town itself. When any sign of the trail vanished, we had agreed on taking what we thought was the safe option – a higher line closer to the summit ridge, but half an hour after agreeing this decision I watched my friend who was taking his turn break trail falter. The snow was loose and underneath the snow was scree. My friend’s crampons got no purchase on the snow and loose rock fell away beneath him: he just managed to arrest his fall. Digging through the snow and rock with his ice axe he found solid ground and steadied himself. Looking up, a shiny marble rock face prevented us from safely climbing up. Looking down, the scree undermined the stability of the snow. We cracked out the GPS: it confirmed we were about 80 vertical metres above the trail and we had no direct route back down to it. Looking at the sun dipping lower in the sky and the cloud rolling in, we gave each other a knowing look. Our progress had been slower than we had hoped and the route more demanding than expected. We had many hours more ahead of us if we continued, on increasingly technical terrain, but only a few hours of daylight. With a sigh, I voiced what we were both thinking and we set off in the last few hours of daylight back the way we came. Today wasn’t our day to tame ‘The Horse’. Just found your blog. Looks good, I will following your updates. Good decision on this trip to head back the way you had come, the hills we still be there next time! Thanks for your support! I’ve got a busy 2014 ahead with marathons, triathlons, mountains and travel so I should have plenty of fodder for the blog!